German 20th-century maroon morocco gold-tooled with silver clasp by F. Halle of Leipzig. Corrected (Jan. 24, 1704?) by an inquisitor at Malaga; purchased by J. Pierpont Morgan (1837-1913) from Olschki in 1907; J.P. Morgan (1867-1943). Ms. book of hours for the use of Rome (Hours of the Virgin, Office of the Dead); calendar in French; written and illuminated in France, probably Paris, ca. 1460. 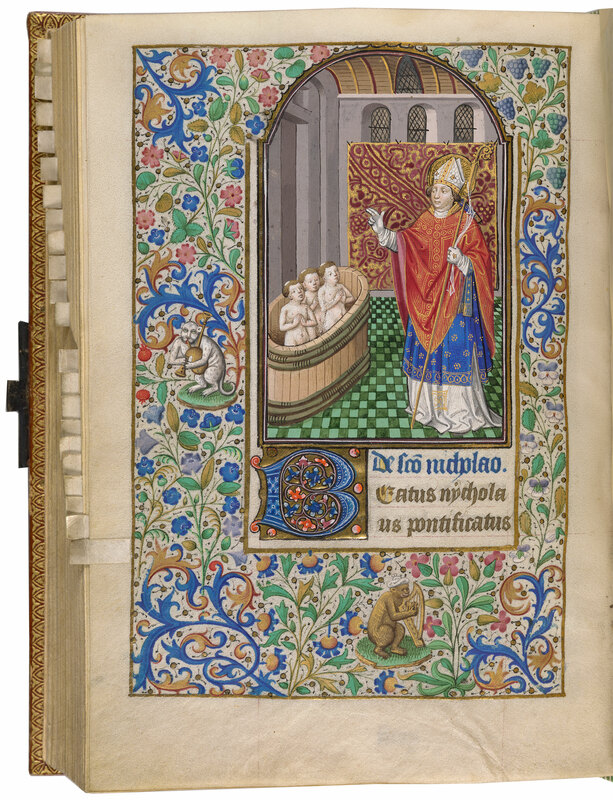 Decoration: 29 miniatures; 1 miniature, depicting the Virgin and Child, formerly between fol. 117 and 118, is now owned by The Caramoor Foundation, Katonah, New York. Artist: a follower of the Master of Jean Rolin (23 miniatures) and a late follower of the Master of the Munich Golden Legend (6 miniatures and the leaf held in Katonah, New York).